The outdoor thermometer read 108 degrees yesterday. One hundred and eight. But despite the fact that summer is still going strong and southeast Texas is only going to get hotter (waaaah!) before it gets cooler, we’ve started seeing just the faintest hints of a distant end to summer: “Meet the teacher night” announcements on the elementary school sign. The high school football team out practicing. Pre-lit Christmas trees on display at my local nursery. Christmas trees. Normally, I’m not above buying canned pumpkin in August, cranking down the AC, and baking pumpkin bread to fake cooler weather but the AC is as low as the budget will allow already – and that’s not cool enough for pumpkin bread. And I can’t bring myself to make a pot of chili, even for preseason football and Frito pie. Our favorite way to eat sweet potatoes is to grill them, the smokey rounds benefiting from a drizzle of a tangy vinaigrette slightly sweetened with maple syrup and a hint of cinnamon. It’s the fresh, smokey flavors of summer with just the faintest hint of fall. A very, very welcome hint. Smokey sweet potato rounds topped with a tangy maple vinaigrette. Toss potato rounds with olive oil and season with salt and pepper. Grill 8-10 minutes on each side, until the potato is lightly grilled and fork-tender. Whisk together the garlic, mustard, vinegar, cinnamon, and maple syrup. Slowly stream in the olive oil while whisking. Drizzle the vinaigrette over the sweet potato slices and top with parsley. Sweet Potato Wedges with Bacon Vinaigrette – a holiday favorite! There is a VERY good chance I’ll be making this recipe tonight! I love sweet potatoes, but have never grilled them, and the vinaigrette sounds fantastic. Umm I need these in my life now. I have some maple syrup leftover from BLT pizzas, I will be making these soon! Ohhhh yummy! Such pretty colors ! I’m totally a sweet potato year-round proponent. I could eat it every day and be oh so happy! Especially grilled and covered with maple sauce…holy yum. this is ingenius. i never thought to grill them. oh my i know what i am having tomorrow night. I’ve never grilled them before. Really yummy recipe. A must try! I’m a HUGE pumpkin fan, but I agree, it’s not *quite* time to pull it out & start baking. Sweet potatoes I don’t really start doing much with until they begin to appear in my CSA box, and so far… none yet! But I know when I get my first batch, I’ll be making this recipe! These look delish! I love grilled sweet potatoes but this is such a pretty way to serve them. Thanks, Jessica! The recipes are formatted using a plugin that my husband wrote. It’s not publicly available yet but I’ll let you know when that changes. I’m always trying to think of new things to throw on the grill. This sounds like the next thing I will try. Yum! Bookmarking this immediately. What a great idea! Oh goodness…I am so glad I’m not the only one who cranks the A/C just to wear long sleeves burn an apple candle, bake, and pretend it’s fall. I had a delicious salad with butternut squash in it at a great restaurant the other night. I’m using what you’ve created here and running with it. I MUST recreate that salad! Although I bet these are great off the grill, I am imagining they make a great prep-ahead side dish. Wow sounds like it’s hotter in Texas than in Israel! I love anything sweet potato and these are right up my alley. YUM. These look oh so tasty and perfect for the grill! Thanks for the inspiration! 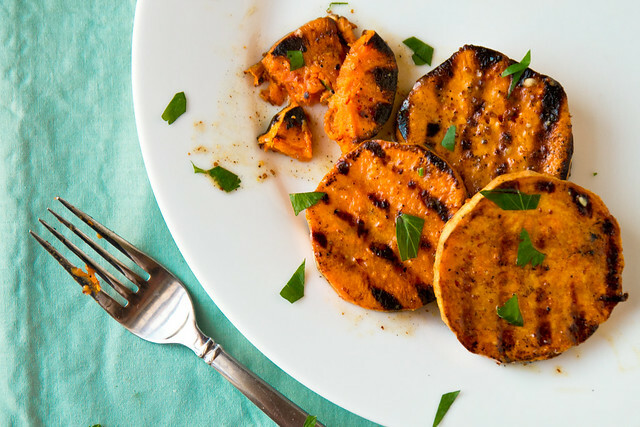 I love grilled sweet potatoes and this looks like a very tasty recipe! Will definitely have to give this one a try! I love sweet potatoes. I have had sweet potato french fries before, but never rounds in this fashion that are almost like eating pancakes. The recipe sounds delicious, and that photo is sweet. Thanks. I am no opposed to eating sweet potatoes year round, and this recipe makes me want to eat them RIGHT NOW. Love the combo of the grill and the maple vinaigrette. I just made these tonight (because I forgot to properly prep for my pre-planned meal) and it was fantastic!! This just might be my new favorite sweet potato recipe. Thanks! Glad you liked them – they are my favorite way to eat sweet potatoes! LOVED these. Thank you! 🙂 I subbed dijon b/c it was all I had but they were still fantastic.